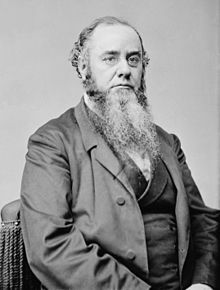 Edwin McMasters Stanton (December 19, 1814 – December 24, 1869) was an American lawyer and politician. He was the United States Secretary of War under Abraham Lincoln administration during most of the American Civil War. Stanton's effective management helped organize the massive military resources of the North and guide the Union to victory under the command by Ulysses S. Grant. Stanton was born in Steubenville, Ohio, the eldest of four children to David and Lucy Norman Stanton. Throughout his childhood and adult life Stanton suffered from asthma. Stanton studied at Kenyon College. He was also from Pittsburgh, Pennsylvania. He was married to Mary Lamson from 1836 until her death in 1844. They had two children; Lucy Lamson and Edwin Lamson. Then he was married to Mary Hutchinson. His brother David committed suicide. Stanton died on December 24, 1869 in Washington, D.C. from respiratory failure, aged 55. This page was last changed on 15 May 2016, at 15:19.